I was very excited for this maternity session as it is in one of my favourite places - really close to Airdrie and Calgary, Alberta - Big Hill Springs Provincial Park. If you have never been there before, you have to check it out and go for a little hike - it has everything you need without going too far from the city - waterfall, forest, rocks, river, bridges. A very picturesque place and perfect for pictures. When I have met Maria for the first time, she has mentioned that she has envisioned her maternity photos to be done in the forest with trees and sunset and right away I thought - Big Hill Spings park! As you may know I offer a wide variety of different gowns that you can wear during your maternity session. Maria has picked beautiful pink, blue, green and purple gowns - we wanted to make sure we cover all the bases and got some "girly" and "manly" colors as Maria and Drew did not know if they were having a boy or a girl. This photoshoot turned out pretty good, Maria and Drew rocked this session and you don't need me to tell you as you can see this for yourselves - these two are SO IN LOVE!!!! Gorgeous Eva was "rocking rolling" her maternity session. I have added some new dresses to my maternity gown collection and she was absolutely shining in each one of them. We went to a nearby provincial park with a nice little forest and a beautiful waterfall and I was amazed at how confident, beautiful and natural Eva looked. My gown collection is now close to 20 different dresses in many colours and styles. Book your maternity session today and I promise I will make you feel and look like a Goddess with memories to treasure forever! I was so happy when Liliya contacted me for her Maternity session as she wanted it to be done in the mountains as this is where her and her hubby spend most of their time. I met with Liliya and Anthony in Canmore, Alberta for Liliya's maternity photoshoot and we went to 4 different breathtaking spots in Canmore, just because one location isn't enough to capture all the beauty of Alberta's mountains and nature. The snow has melted and you can feel the spring air, people were out and about and we have even been able to spot some friendly Elk roaming around. On the way back from the shoot, me and Sophia (my little assistant a.k.a. daughter :-)) have stumbled upon a really yummy restaurant called 514 Poutine, which reminded me of our time in Montreal where we always had an abundance of Poutine :-) If you love Poutine and are in Canmore, you HAVE to stop by that place! I wanted to do a maternity photoshoot in the mountains for a very long time. We are lucky to be living so close to the mountains, where the air is so crisp and pure, the view is breathtaking and you feel so connected to nature. Pregnancy is a very special moment in woman's life when your body is working on growing a little human being and you are full of anticipation and excitement to meet your new baby. I believe that nature and the beauty of an expectant mother goes so well together. 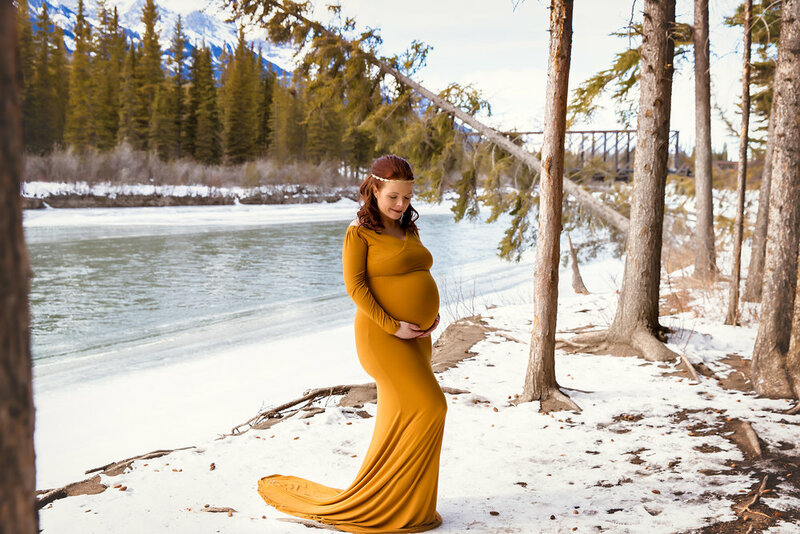 I was very lucky to have gorgeous Nataliya come with me to the beautiful Kananaskis country to model my new maternity gowns. When I see Nataliya's pictures in the white dress, I think that this is probably how the "Mother Winter" would look like if she was a person - simply breathtaking! Britney is expecting her second child - a baby girl in a month. Britney's son Samuel is only 11 months old, still a baby himself, he will be a big brother in a month. During Britney's maternity session when I would say to Britney and Steve to "look at the baby" (meaning look at the belly), they would look at Samuel :-) Can't wait to meet Samuel's little sister in October! Belinda and Joseph are expecting their first baby girl at the end of June. This Maternity photoshoot was so great: trees were blooming with flowers, sun was shining and the weather was nice and warm. Belinda got a chance to change into different dresses and we had a relaxing stroll in my favourite park - Rotary Park in downtown Calgary, where we have a perfect combination of city skylines and beautiful greenery. Looking forward meeting your little baby girl! The Fall happens so fast here in Calgary. One day it is summer and the next day it is Fall... I was very lucky to be able to capture Amanda's maternity session outside in this beautiful Fall weather. Amanda and Mark are expecting their first baby girl in the beginning of November. I can't wait to meet her. Amanda booked my "Belly to Baby" package - which means that I get to photograph this gorgeous family at least 2 more times :-) So exciting! This was a very exciting photoshoot for me. I have met Jenn and Brett a few years back while on vacation in Barbados. I was so happy to find out that Jennifer is expecting a little baby boy this coming Thanksgiving and was honoured when she has asked me to take her maternity and newborn pictures. Jenn and Brett's friend is the owner of the site where the movie "The Assassination of Jesse James" with Brad Pitt was filmed. This place was amazing - old fashioned windows and fireplace, rustic looking houses and fences - a dream location for any photographer! And on top of that we had perfect weather to add to the mood of the shoot. This sweet couple is simply overwhelmed with joy, they are expecting their first son at the end of September. We started this photoshoot in their warm and cozy house and finished on a beautiful lake with a golden hour sunset - a dream evening light. When people say that pregnant women have a "pregnancy glow", I finally see what they mean. Maria is definitely glowing - a beautiful momma with a beautiful smile! Carlynn and Matt are expecting their first baby - a little girl in September, 2016. They have chosen a name but keeping it a secret until the baby is here. Let's start guessing ... would it be Carly? :-) Sometimes I meet people and have a feeling as though I've known them my whole life, this is how I felt with Carlynn and Matt. They are just so sweet! These two had so much chemistry between each other that it almost felt like an engagement photoshoot :-) I had a hard time choosing pictures to post on this blog as there were so many great ones. Can't wait to meet your little one! This weekend I had a maternity / family session and usually I do my maternity sessions at around 35 weeks, however Samanta's was an exception. She is on her last week and is ready to have her son any day now. Her little daughter Abby was super adorable, just playing with her dolls, enjoying her time at the playground and being a happy, busy toddler. I had so much fun capturing this young family's interaction with each other and you can feel all the love in the air. Danaye and Matt are expecting their first baby around the beginning of July, and decided to keep the gender of the baby a surprise. I am always so amazed with parents' patience who decide to do this, as I couldn't do it with either of my babies. Danaye is a local radio personality, making Calgary laugh every morning with her amazing sense of humour during the Virgin Radio morning show on 98.5 FM. In the evenings she entertains with her band - The Barn Burners - performing their music throughout the city.